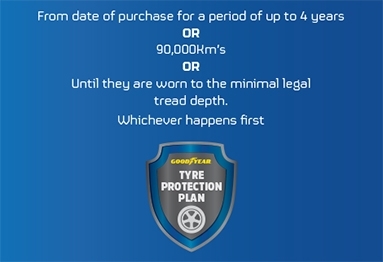 It’s an exclusive warranty to help protect your Goodyear and Dunlop tyres* against certain types of damage. It covers puncture repairs, impact fractures, accidental cuts and kerb damage. 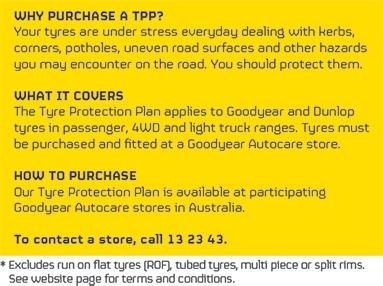 If your tyre(s) fail for these reasons, we’ll provide and fit a replacement tyre. The only cost to you is for the tread used. That means if 10% of the tread is worn, you pay 10% of the original price for a new replacement tyre. Legally repairable punctures will be fixed for free for the life of the tyre.